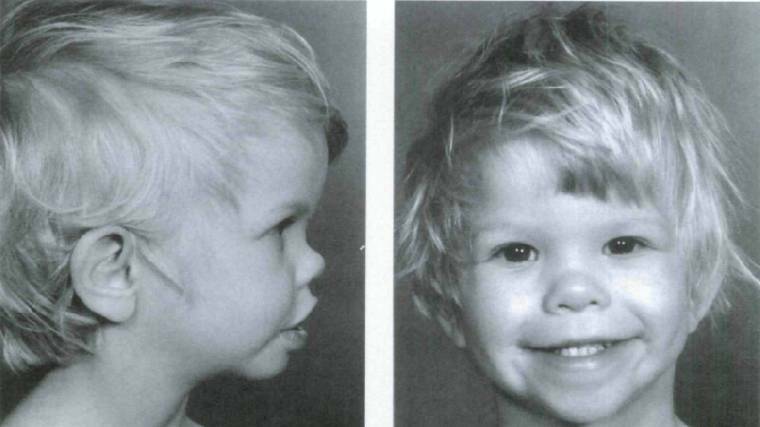 Williams Syndrome is a relatively common genetic disorder, found in 1:10,000 live births. The disorder results from a deletion on chromosome 7q11.23, a region including the Elastin gene. This deletion results in variable phenotypes. Vascular Anomalies commonly include supravalvular aortic stenosis (shown below), however deficiency of elastin can lead to narrowing in any artery. These vascular anomalies can lead to hypertension. Impaired cognition and impaired development with a friendly, outwardly social personality. Endocrine abnormalities, which include short stature, hypercalcemia (irritability, vomiting, constipation, muscle cramps), diabetes mellitus, and hypothyroidism. GU/Kidney abnormalities, such as dysfunctional voiding and nephrolithiasis. Sensitivity to sound and sleep problems. Patients with Williams Syndrome are good at auditory rote memory and specific aspects of language and are described as having a "cocktail party personality" because of their friendliness . 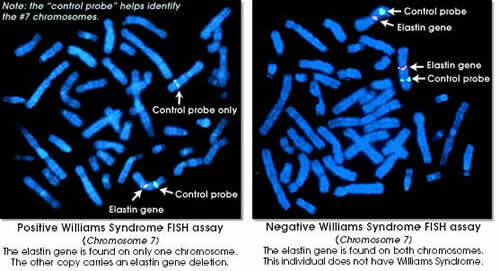 Clinical diagnosis should be confirmed with FISH (fluorescent in-situ hybridization). The AAP provides guideslines for continued management of childrens with Williams Syndrome (click image below). Individuals with Williams Syndrome also need annual evaluations of BP, Physicals, Development, Cardiac, Auditory and Visual testing because problems in these areas are often progressive. Furthermore, children with Williams Syndrome in general are smaller than average children of similar age, so special growth charts specific for those with Williams should be used. The Williams Syndrome association provides modified growth charts (link). These children should NOT take multivitamins because of inherently increased vitamin D, and should be diligent with use of sunscreen to decrease production of vitamin D.
These children also need periodic cardiovascular evaluations as cardiovascular problems are progressive. Emotional & support resources can be beneficial for families affected by Williams Syndrome to allow for networking with others in a similar situation. Support groups should be offered, in addition to the services of a social or case worker as needed.